Silvia just wants to be loved! *Photo credit for this beautiful photo to Kristie Baer! Thank you KLB Photography! 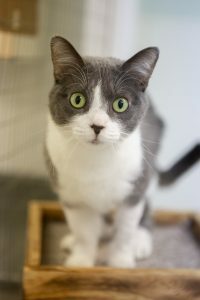 Silvia is a very sweet, curious kitty who loves to play and explore. While she is not a huge fan of being held, she loves being petted and getting attention. Do you have a warm lap and soft hands to give her love? She sure hopes that you do! All our cats are fixed, micro-chipped, up to date on all age appropriate vaccinations, de-wormed, treated for and on flea preventative, as well as tested for Feline Leukemia and Feline Immunodeficiency Virus.